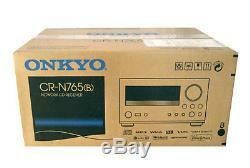 New ONKYO CR-N765B network CD receiver hi-res sound black from Japan. Brand New in Original Box. This list is Receiver only. Supports DSD 5.6 MHz native playback (via network / USB) Supports playback of WAV / FLAC 192 kHz / 24 bit file etc. High resolution sound source Compliant with DLNA 1.5, Home Media function installed Adopt AKM's flagship series "VERITA" AK4490 for DAC Full discrete DIDRC headphone amplifier installed. Digital connection with iPod / iPhone and USB cable. Supports remote application Onkyo Remote that can be operated from iPhone or Android terminal. We are sellers of Japan. To satisfy our customers, we will do our best. International Buyers - Please Note. These charges are the buyers responsibility. We do not mark merchandise values below value or mark items as gifts - US and International government regulations prohibit such behavior. The item "New ONKYO CR-N765B network CD receiver hi-res sound black from Japan free ship" is in sale since Saturday, February 24, 2018. 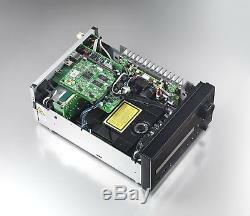 This item is in the category "Consumer Electronics\TV, Video & Home Audio\Home Audio Stereos, Components\CD Players & Recorders". The seller is "skmt01" and is located in Tokyo. This item can be shipped worldwide.